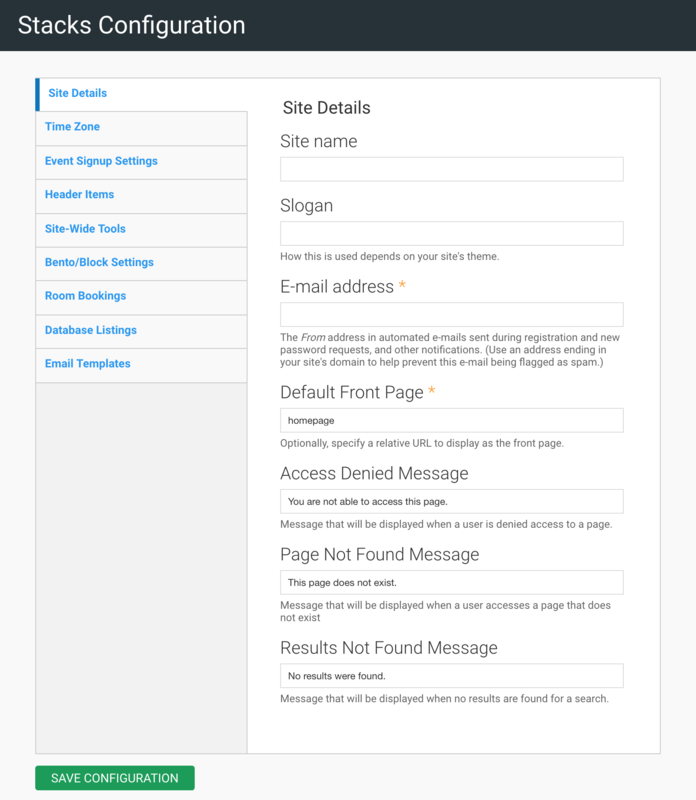 Configure site-specific details including the site name and slogan (which can appear in the header), the email address from which automated emails will be sent from, the icons you will see on your homepage, your timezone, and more. 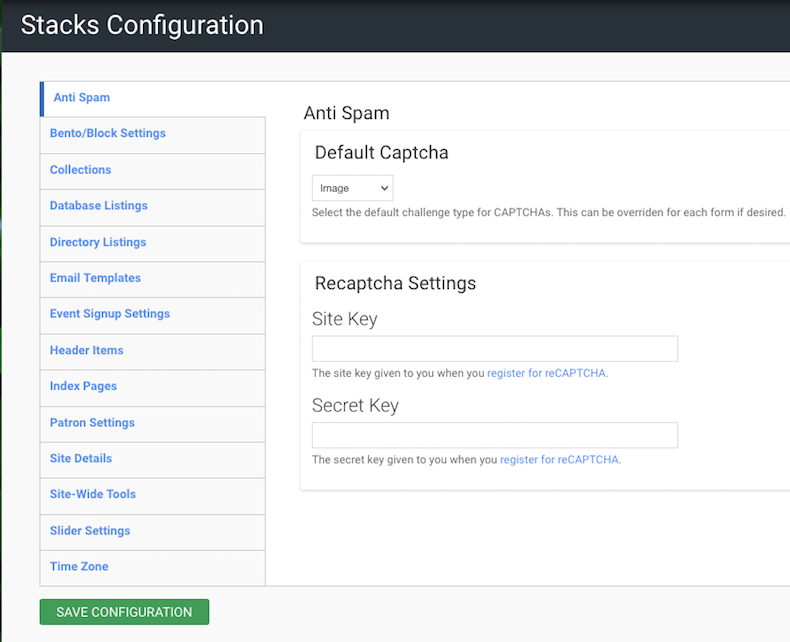 To prevent spam, we recommend using Google reCAPTCHA on all forms on your Stacks site. 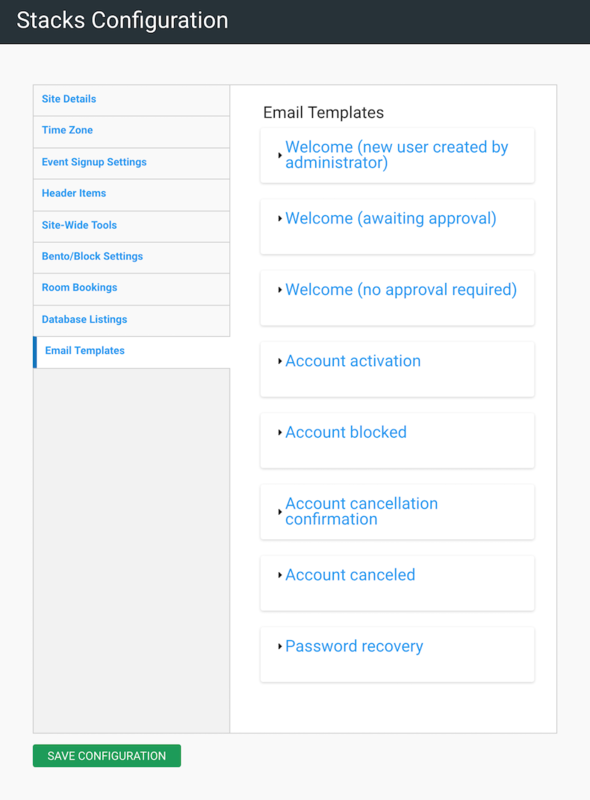 This includes 'Easy Forms' like on your 'Contact Us' page and sign-up forms in your 'Events Management' tool. This reCAPTCHA tool will be enabled for users who are not logged in to your Stacks site. reCAPTCHA is a free service from Google that helps protect websites from spam and abuse. A “CAPTCHA” is a turing test to tell humans and bots apart. It is easy for humans to solve, but hard for “bots” and other malicious software to figure out. reCAPTCHA uses an advanced risk analysis engine and adaptive challenges to keep automated software from engaging in abusive activities on your site. It does this while letting your valid users pass through with ease. 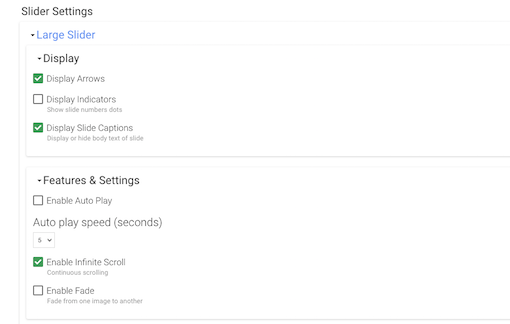 The Google reCAPTCHA API is integrated into your Stacks Site. To use the Google reCAPTCHA API, you must first go to Google and register your site. 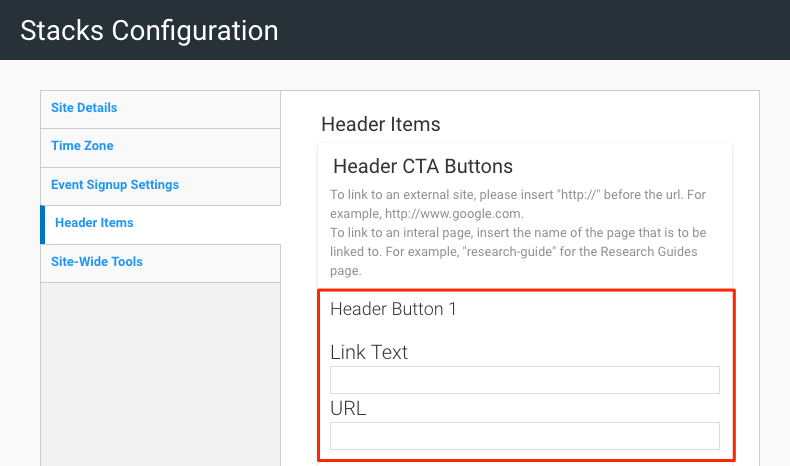 Google will then provide you with API keys that you will then copy and paste into your Stacks site. Click on the tab on the left to see step by step instructions on how to register for your API keys. This tab allows you to configure your Bento settings. You can decide whether to hide the icons by toggling on that feature. 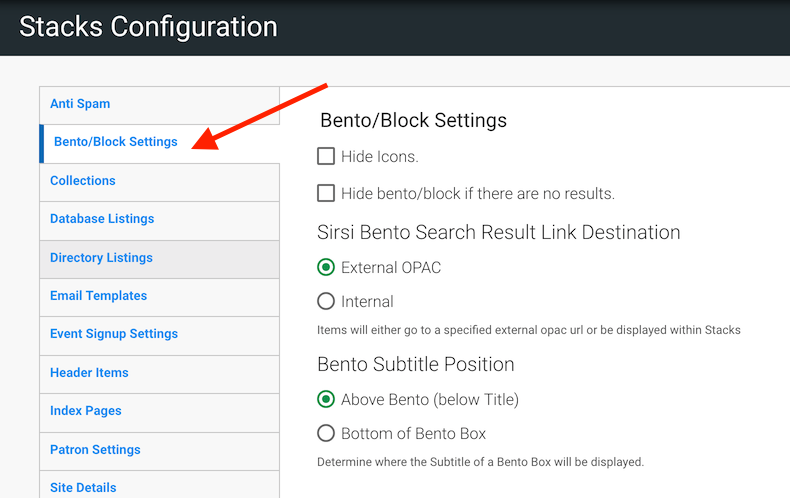 You can control whether the results boxes in the Bento Search area appear and display a no result message or simply do not appear when they do not return any results for the current search. You can also configure your Sirsi integration here: you can decide whether Items will go to a specified external opac url or be displayed within Stacks. Choose here where you want the Bento Subtitle to display, either above the bento box or beneath the bento box. Your Collection Settings can be configured here. Choose to have the first collection item expanded by default when you view the collection. Choose to hide the description of a collection item on the Listing Page. Here you can configure your settings for your Databases page. 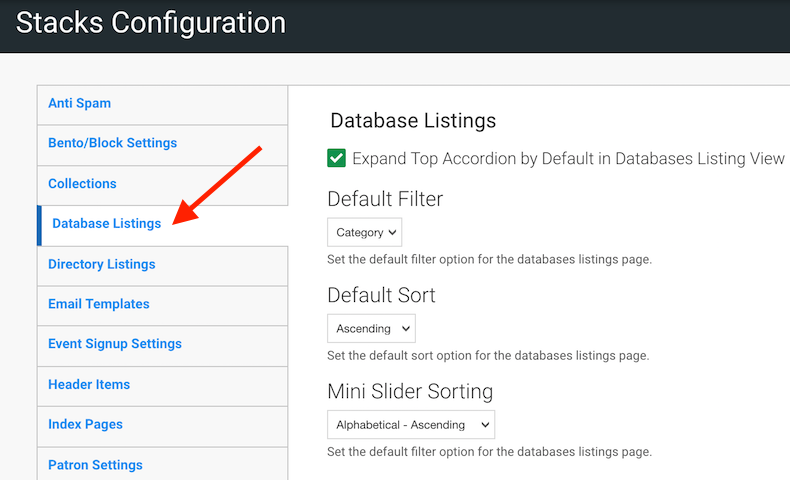 Click the checkbox next to "Expand top accordion be default in the databases listing view"
The default Sort allows you to determine how the listings will be sorted, either in ascending order or descending order. 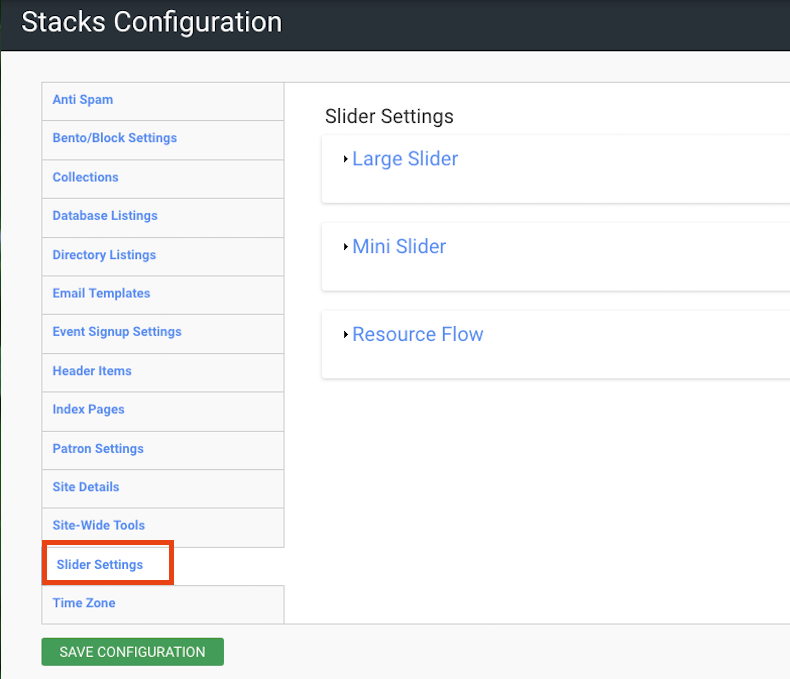 The Mini Slider Sorting allows you to determine how the mini slider on the database page is sorted. 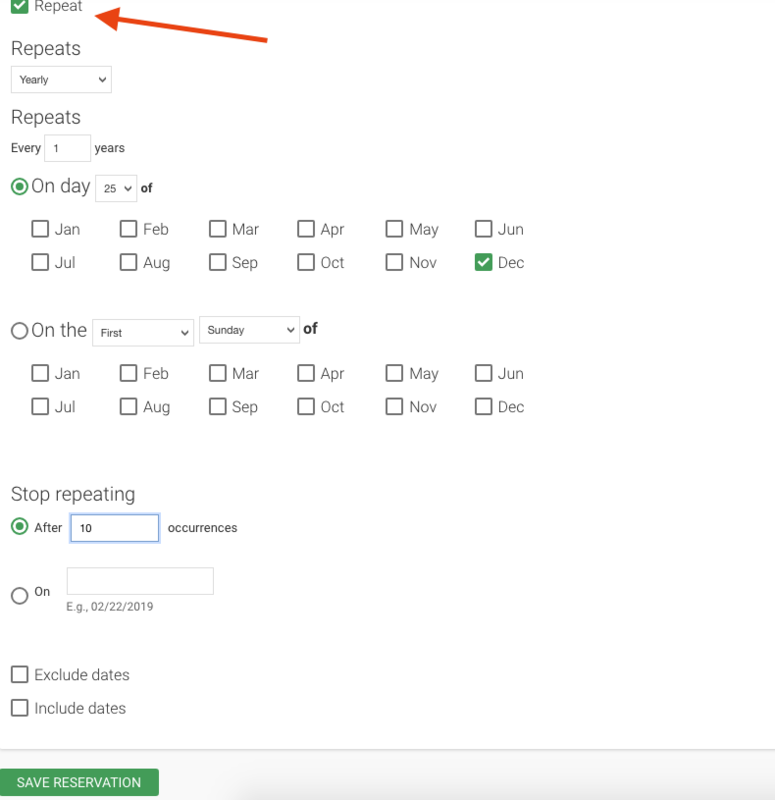 You can choose ascending or decending alphabetical order, or to sort by date added. Choose your settings here for your Directory Listings Page. Choose whether you want your directory listings to be sorted alphabetically by last (or family) name. By expanding any of the boxes associated with these different email notification you can customize the Subject and Body message of each individually. 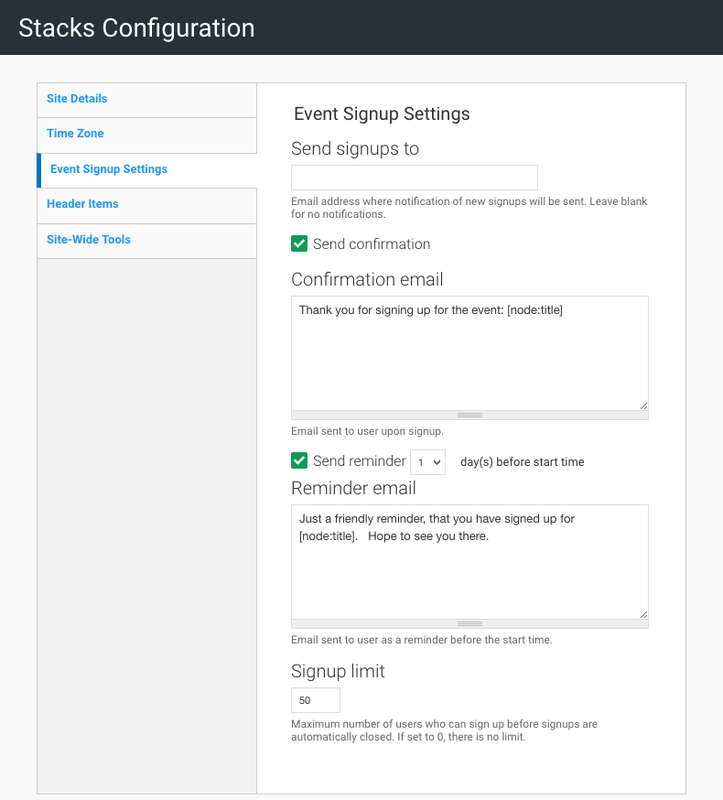 Configure the default settings for event signups. These are the signup details that are given to new events created in your Stacks site. 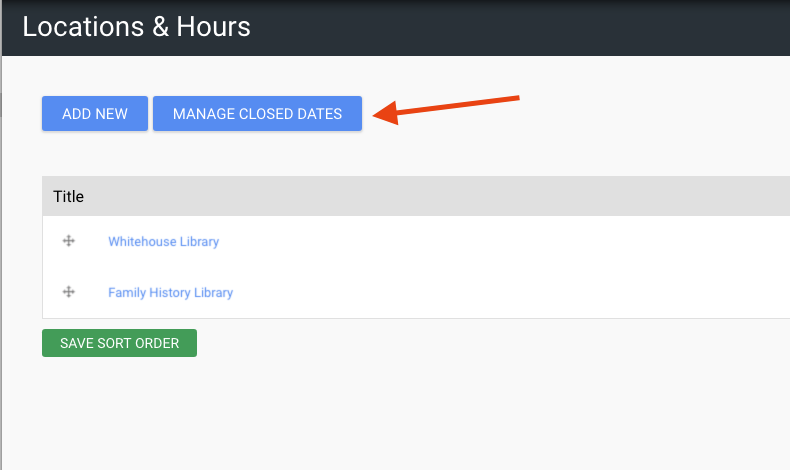 If the user clicks on this bar, a modal will pop up with that location's hours for the current day along with their contact information. If you've chosen to include an image with the modal (modal image), it will be included at the top of this popup. Navigate to your dashboard and open the 'System Configuration' tile. Add a 'Purpose' for example "Christmas Day"
Choose the date of this Closure and how many times you want this closed date to repeat. For example, we can set 'Christmas Day' as December 25 each year for 10 years. 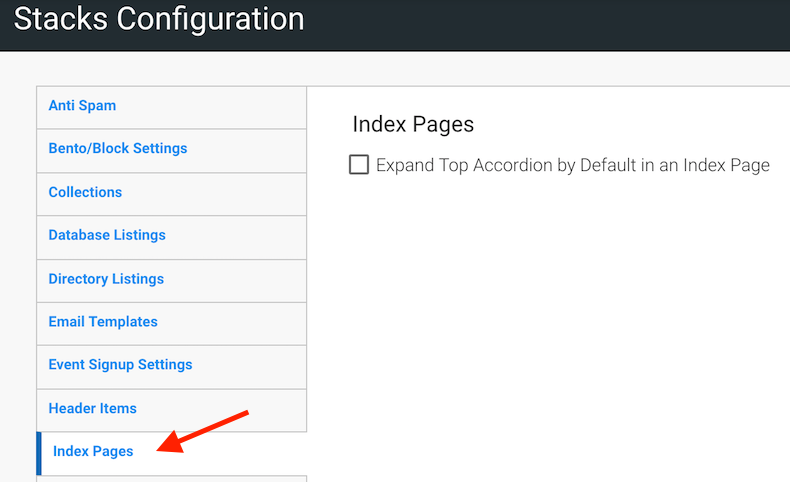 Here you can configure your settings for your Index Pages. 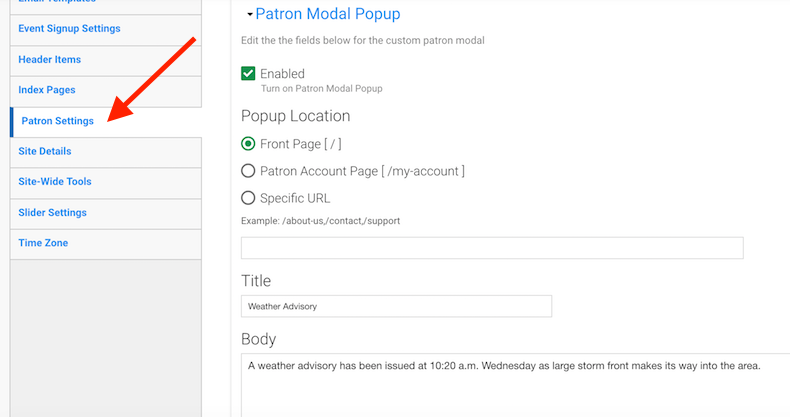 Configure your patron settings here. 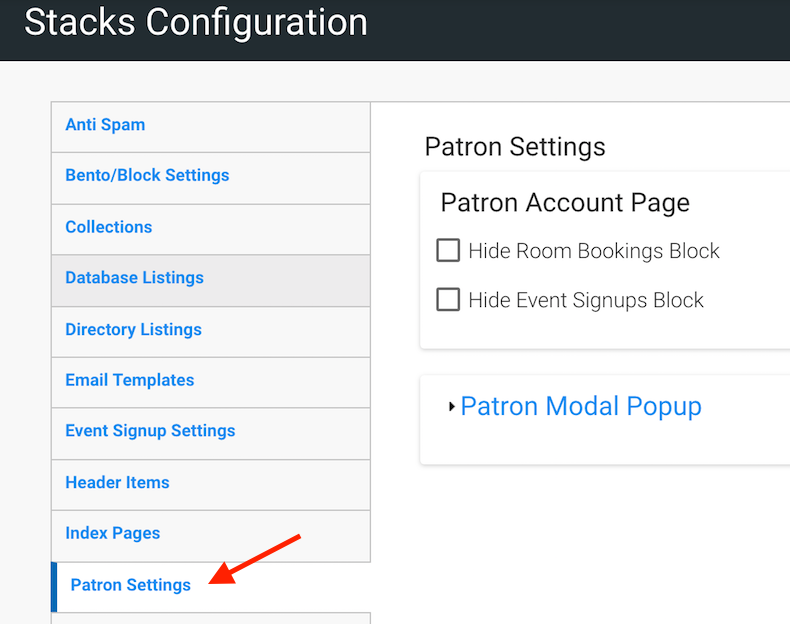 Turn off Events and /or Rooms blocks in the Patron Account (if these are not features that you are currently using on your Stacks Site). If site-wide password protection is enabled, users must be signed in to access any and all pages. 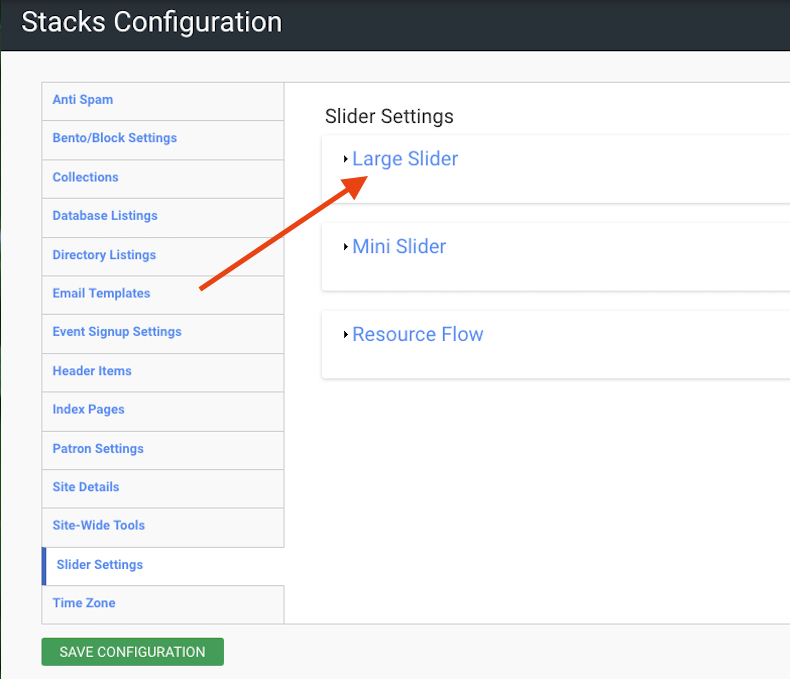 This can be helpful during the initial setup up phase, or for organizations whose Stacks website is not intended for public viewing. Note: You can specify whether the initial login displayed accepts "Patron" login credentials instead of "Administrator/Staff" credentials. Using the "Set Patron login form as default" checkbox. As well as redirect the staff or patron user to the homepage on login. By default, the Patron is taken to "My Account" and Staff are sent to the Stacks Dashboard. If you want your patrons to be directed to a specific page on logging out of their 'My Account' page, you can specify the URL of the redirect page here. Here you can choose to hide the location bar from your home page and /or the search bar from your site. Choose a language for your tile in your dashboard. The default language is English. Your users' Stacks experience may not be optimal if the browser they are using is not up to date. Enabling this feature will warn users when their browser version might affect functionality. To access these options, Navigate to your Dashboard and select the 'System Configuration' tile. The time zone may affect Room Bookings, the Calendar, and Events among other features. It is important that this is set appropriately. 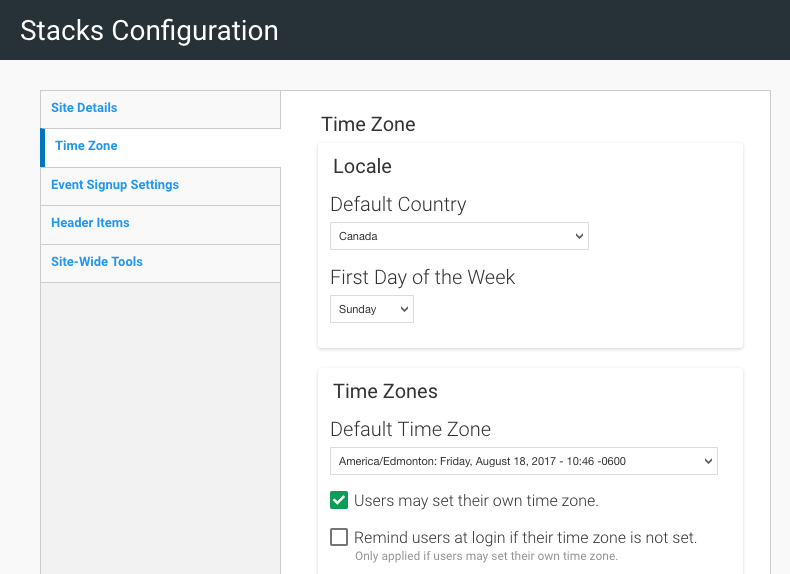 Choose whether new users should have the time zone set as the default, empty, or may set their own at registration. 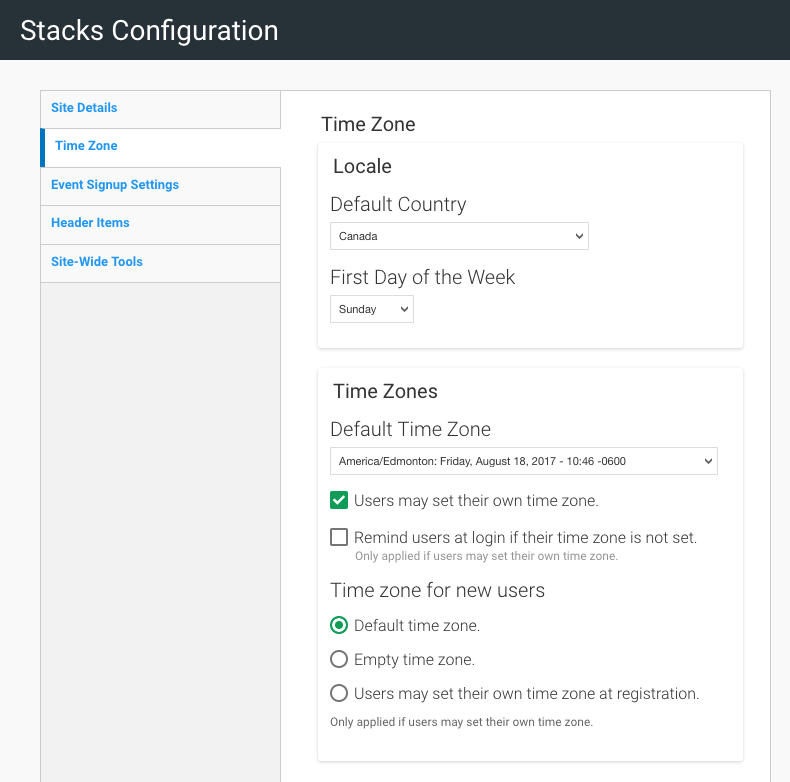 This last option only applies if you have also chosen to allow users to set their own time zone.